The summer has already begun and we have equipped our fleet with the latest models of the best brands on the market. Which of them is the summer car of your choice? Participate in our Mini-Poll! This year we have more than 4,000 active cars on the Costa del Sol, but remember to hire your car at Malaga airport as soon as possible, it will be much cheaper and you will have more models available to choose from. 60 Responses to Poll: Vote your Summer Car 2018! Have used Malaga Cars for nearly 20 years now and they have got better and better each year. In June we were given a brand new VW Golf … no pressure to keep it in perfect condition then!! However we did manage to make sure it was returned without a scratch From pick up at the airport to dropping back at the airport their service is quick and simple, why would you choose anyone else? Looking forward to seeing you again in September. Thanks Gail, see you in September! I go for the Renault Captur, definitly the most comfortable car of the five. We are very happy with MalagaCar, the best car rental company that I know. Till next time. Wij zijn reeds een tiental jaren klant en hebben nog nooit een probleem gehad.Steeds vriendelijke service zowel bij afhalen als terugbrengen.Tot eind augustus! And we Will see you juli 20th. That’s nice, thank you Harm! I have used MalagaCar on several occasions, and so have my friends; hiring everything from convertibles to two door models. Our experience has always been great, though I do believe that their surcharge for those arriving outside of business hours at Malaga Airport is out of order. Be careful, and do study this expensive small print detail. It may well be worth your while taking a long coffee before picking up your car. Even if you take a taxi down to their place, a few hundred yards down the road, they will still sting you. That said their charges, outside of that caveat, are fair and we have never had any other issues with them — after all, you should know what you’re paying for before you enter your credit card details. I would, however, recommend that you video every knock and scratch on your hire car, just to be sure that you do have evidence of the state of the vehicle you hired, prior to driving off in it. Having said all that, we have never had any need to produce this evidence, since they have always been straight forward and fair. I will continue to use them time and again until something drastically changes. A laid back and transparent hire firm, in my extensive experience. No hire firm is perfect but they come close, bar for the warnings highlighted above. Thank you for your comment! About the out of business hours pick-up charge, it’s specified in your online quotation, so you don’t get any surprises on arrival. Great cars, great service. Best ever, Quashqui diesel last April. Going to England, Wales and Scotland this year have rented Quashqui again, but unfortunately not from Malagacar! Hi James! The Nissan Qashqai is a fantastic vehicle, we hope to see you again very soon. I have used Malagacar.com many tomes already as well as my son. We both have been very satisfied with the service and the personal is extremely polite and pleasant. My son will book again in July and I in August. Thank you Marie-France, we hope you choose our company for years to come! We have now been using MALAGA CAR in 3 years. We have had only Renaults. So our LOVE car is the Captur. Also like to thanks for the always good service and smiles. See you in Week 29 and later in Sep/Okt. Thanks Michael! Renault Captur is third at this moment, let see if there is a comeback! You have a good and correct service! I booked a car from you on 1st till 15th May ( megane or similair ) then realised i didnt need a car that size so contacted you to request a downsize to a fiat panda which was arranged. Upon arrival we were given a very nice Toyota auris ,many thanks ,we have only used your company twice but will continue to do so as long as we travel to Malaga. many thanks again and look forward to next May. kind regards, Tony Paterson . Thank you Tony! See you in May. Hi Patrick, we don’t have any Hyundai in our fleet. Do you mean Kia Ceed? I hired in May for 10 days and have been for about 10 years and I have to say service from your staff was excellent as usual, I have recommended Malaga car to.many of my friends, that’s again and see you later this year. Thank you Paddy! As our return customer please book always with your client menu to benefit from your increased discount of up to 20% (1- 5 rentals: 5%. 6 rentals: 6%… 20 rentals: 20%). Then you can login into your account where will be applied automatically the discount, depending on the number of hires you have already made (Please use always the same email). Kind regards! Upgrade on the Corsa, I usually get. Thank you Barry! As our return customer please book always with your client menu to benefit from your increased discount of up to 20% (1- 5 rentals: 5%. 6 rentals: 6%… 20 rentals: 20%). Looking forward to driving the Captur I’ve booked and collect Wednesday 20 June. Excellent Steve, have a good flight & see you soon! Kind regards! Thank you Steward! As our return customer please book always with your client menu to benefit from your increased discount of up to 20% (1- 5 rentals: 5%. 6 rentals: 6%… 20 rentals: 20%). Very pleased with your service and hope to be offered the Alfa Romeo Giulietta on June 23rd when we arrive in Malgaga. We´ll do our best Lars! ;) Have a good flight & see you on the 23rd! Have used Malaga car.com for a number of years now and am a registered VIP member. Always had great cars with no problem and great service. UNTIL this year. Car nearly 2years old, judging by the plate. 40000 k on the clock, Dented, no aerial, so no radio, stains on seat. Half full of fuel 4 out of 8 bars and dropped a bar on the gauge within a few miles of airport. 3rd bar lasted ages, so only just half full? But would use them again as service and pricing is good and better than others that we used to use in the past . I like to think we were just unlucky this time. Will certainly try again next time. Hello John, I have forwarded your query to our Manager, to see what he can do for you, kind regards! Thank you Geoff for being our loyal customer! Please book always with your client menu to benefit from your increased discount of up to 20% (1- 5 rentals: 5%. 6 rentals: 6%… 20 rentals: 20%). Thank you Ted! 😀 As our return customer please book always with your client menu to benefit from your increased discount of up to 20% (1- 5 rentals: 5%. 6 rentals: 6%… 20 rentals: 20%). We love Malagacar and tell our friends anout you. Allesys good service and good cars. We are rental-vustomer for several years for me and Wiife and our 8 children with their familys. For us the best CAR will be family CAR. Thank you very much for your feedback Jon! As our return customer please book always with your client menu to benefit from your increased discount of up to 20% (1- 5 rentals: 5%. 6 rentals: 6%… 20 rentals: 20%). Very happy with Malagacar.com. Using them for over 10 years and still will use in july again. Thank you very much Farida for being our loyal customer! Please book always with your client menu to benefit from your increased discount of up to 20% (1- 5 rentals: 5%. 6 rentals: 6%… 20 rentals: 20%). My favorite is Malagar. 20 rentals now. Nice cars, nice staff, no fuzz! Thank you very much Peter! As our return customer please book always with your client menu to benefit from your increased discount of up to 20% (1- 5 rentals: 5%. 6 rentals: 6%… 20 rentals: 20%). I like the style of the new model Stelio,family comfort with loads of style,and is a head turner at the same time, I have booked my vehicle for our summer with you as always i hope this noble would be available. Excellent Jim! Best regards & see you very soon! As our return customer please book always with your client menu to benefit from your increased discount of up to 20% (1- 5 rentals: 5%. 6 rentals: 6%… 20 rentals: 20%). Thank you very much Sarah! As our return customer please book always with your client menu to benefit from your increased discount of up to 20% (1- 5 rentals: 5%. 6 rentals: 6%… 20 rentals: 20%). 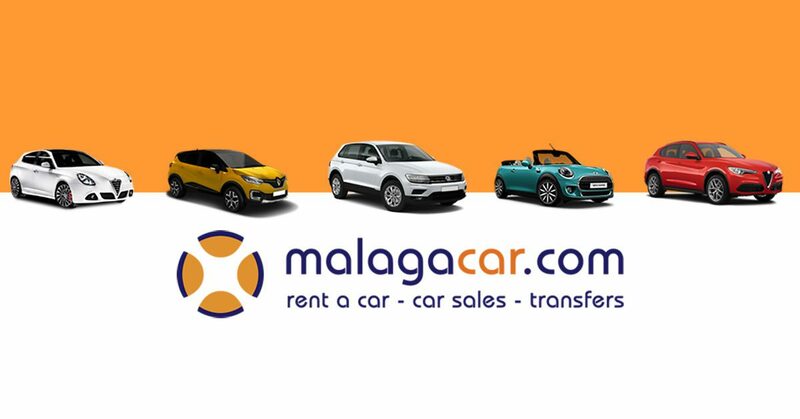 Malaga car hire , simple, easy and very friendly staff. Wouldn’t think of leaving them. Looking forward to using them again and again . Thanks for being our loyal cutomer Austin! As our return customer please book always with your client menu to benefit from your increased discount of up to 20% (1- 5 rentals: 5%. 6 rentals: 6%… 20 rentals: 20%). Hello James! You don´t like the Mini convertible? 😉 We give upgrades whenever possible but of course we cannot promise beforehand as it depends on availability. Best regards & enjoy your coming 50th birthday on the Costa! Oops my fault I didn’t see the mini before I posted . I was just trying my luck with the upgrade. Thanks again . Looking Forward to seeing you sooonnnn!!! Thank you! Seems that the VW Tiguan is taking the lead. See you very soon! This summer I would prefere to have a VolksWagen Tiguan. I am very satisfied with MalagaCar.com, and will be using your company again in September. Hi Arne, thank you very much for your vote!